The Why’s and How’s to Crate Train Your Dog. We at Dogs Day Inn LLC Dog Boarding offer cage free dog boarding so why are we talking about crate training your dog? Crate training your dog makes it easier to board a dog without a crate as it is used to being in enclosed areas, and learns to ask to go outside to do its business. Starting with when you bring your puppy home, or rescued dog, it will have bad habits as they are an animal and our homes make great places to urinate and deposit waste, and give ample opportunities to chew on furniture worth thousands of dollars. Crate training is a way to train your beloved pet to not only, not do these behaviors, but to also be easily boarded, and traveled with. The dog will learn to love its crate and see it as a place of protection, its own special place, and a secure environment. This can even be while traveling in a car, in a hotel, a dog show, or visiting at someone else’s house. Dogs will rarely relieve themselves where they sleep or soil their dens, or crate. First if you’re starting with a puppy get a crate large enough to house the adult dog, with a divider that you can move as the dog grows. The crate should be large enough for the dog to sit, stand, and laydown relaxed in a stretched out manner. While there are many crate manufactures out there, we really love the KONG® Space Saving Double-Door Pet Crate. This crate offers everything we have found useful in a crate and can fold up when not needed. 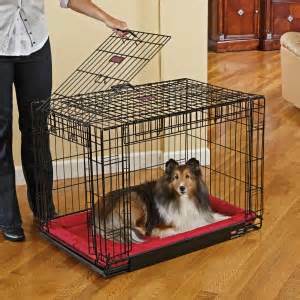 They also offer a matching pet pad that fits well into the crate. One of my new customers has purchased this crate and has found it to be easily adjusted with the divider as the puppy is growing. There are two schools of thought about crate training and one is it should never be a place of punishment, and the other is to use it to put your pet in when it misbehaves for a short period of time, kind of like a time out. Many say that a puppy cannot control their bladder for long periods of time and should not be left in the crate for more than 3 or 4 hours, we have found you can train a puppy to stay in and be comfortable for longer periods of time, with training and extending the time over several weeks. Every dog will be different and you may have to experiment a little to make sure your puppy or dog can handle the time it needs to be enclosed. A crate is not a cure all or a dog sitter it is after all it is a cage. Your puppy or dog will still need plenty of exercise, time with you and the family to be a well-adjusted dog. We do not condone leaving the dog in a crate all day and night and taking it out for short periods of time. Having a dog is a responsibility and a commitment; you are committing to feeding, caring, loving, and exercising your dog like you would any other family member. Never force your pet in the crate, make it a place it enjoys, and give it a comfortable bed, and toys to play with and it will learn to go in on its own and be relaxed. Use treats and feed your dog in the crate so they learn it’s not a bad place but remember if you feed your dog in the crate most dogs will need to go outside about an hour after feeding.